1♥ As always, I start off with a primed lid using the Lorac Behind The Scenes Eye Primer. Then, I move on to eyeshadow. 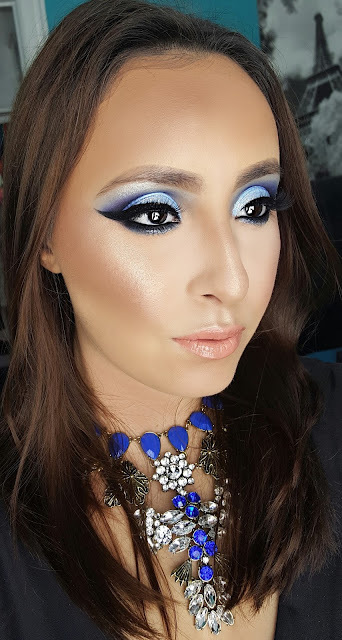 For this look, I can't use any of my traditional transition shades, so I opted to sticking with blue shadows. With a big fluffy blending brush, I swept Makeup Geek Neptune Eyeshadow (bright blue) through my crease and brow bone. I found this shade to be particularly patchy and hard to build up. However, for the purposes of being a transition shade, its sheerness actually worked to my advantage. 2♥ I wanted the blue to be more vibrant as it got closer to the crease, so I used a smaller blending brush to apply Coastal Scents Hot Pot in CM09 (navy blue). I only took this shade halfway through my crease as I really like how this method defines the eyes when they're open. Also, I went back and forth between the bright and navy blues, making sure I had the blend perfect. 3♥ To deepen the crease ever so slightly and add in a slightly different tone, I took a little bit of Coastal Scents Hot Pot in Edgy Eggplant (dark purple) on a pencil brush and added that to the very outer corner of the crease. I wanted it to be subtle so I made sure to blend it out with the blending brush from the last step. 4♥ Now to clean up the lid for the sparkly lid colors to come and create a sharp cut crease. I used Inglot Gel Liner in # 70 (periwinkle) on an angled eyeliner brush to create a crisp line between the crease and the lid. Then, I blended out the remaining liner onto the lid to be used as a base. 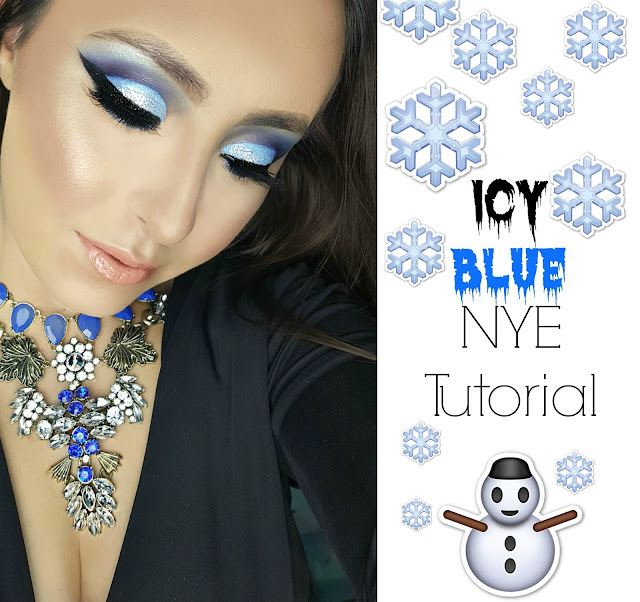 5♥ For the all over lid color, I mixed two different icy shades. While they're both very light, icy blues, they can come off as white on a blank lid hence why I applied them over a blue base. Using a dampened flat synthetic brush, I applied a mixture of Nyx Prismatic Shadow in Frostbite (pale icy blue) and Make Up For Ever Artist Shadow in D-200 (white with light blue reflects) all over where I placed the base. 6♥ Next, apply glitter for the extra festive effect. You'll want to go with a light blue glitter or a glitter that has a light blue reflect. Before applying it, I applied some of the LA Splash Splash Proof Sealer Base to a synthetic flat brush instead of directly on my lid because I didn't want the glitter to be too heavily concentrated. Then, I dipped the brush into Nyx Glitter To Go in Snow and distributed it all over the lid with patting motions. 7♥ Apply eyeliner. I created a pretty thick winged eyeliner, flicking it more out to the side instead of upwards so as to elongate my eye shape. To do this I used the Milani Eye Tech Extreme Liquid Eye Liner in Blackest Black. When this was done, I felt that I wanted a little more definition to the outer crease, so I careful blended Make Up Forever Artist Shadow in S-102 (black) onto the outer third of the crease using a pencil brush. If there are any harsh lines, go back in with the blending brush that you used with the navy blue eyeshadow to sort that out. 8♥ Balance out the look by applying shadow to the lower lash line. First, I applied Inglot Gel Liner in # 77 (black) to the waterline and lower lash line using an angled eyeliner brush. I then used a pencil brush and black eyeshadow to smudge it out and blended out all of that with the navy blue shade and an angled shader brush. 9♥ Apply finishing touches. To help bring shine to the brow bone and blend out the transition shade more, I applied Mac Nylon Eyeshadow (metallic yellowy cream) to my brow bone with a fluffy synthetic brush. I also wanted to add some lightness to the inner portion of my lower lash line so I applied Nyx Liquid Crystal Liner in Crystal Hip. And, in addition to that, I tried out a new pair of House of Lashes in the style Pixie Luxe, which are light and wispy, perfect for a look that already has enough drama.